alternate names, and the appropriate reporting statement. Extensive cross-referencing ensures that you can easily find the right test for efficient and effective practice, and protocol charts guide you through the examination process step by step. 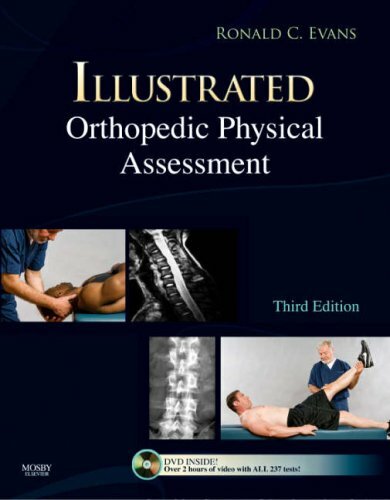 The companion DVD features video footage of Dr. Evans performing each assessment test in the book, along with his expert commentary. Chapters are logically organized by region, and tests within each chapter are arranged alphabetically, so you can find the information you need in seconds! Each test begins with a brief discussion of basic anatomy, then moves into a description of the actual procedure and ends with next-step directives. Critical Thinking questions at the end of each chapter help you apply what you've learned to clinical practice. Orthopedic Gamuts provide summaries of key points in a concise list - numerous gamuts within each chapter help you master material quickly and easily. Clinical Pearls share the author's knowledge gained through years of clinical experience, helping you avoid common misdiagnoses. Cross-reference tables offer at-a-glance guidance on which tests should be used to diagnose particular diseases, for maximum accuracy and efficiency in practice. Each chapter begins with an index of tests for easy reference, and axioms that remind you of elemental information, such as how painful certain maneuvers may be or the extent of some body parts' range. Contains a chapter on malingering (non-organically-based complaints), helping you investigate and determine the root cause of complaint, whether due to injury, for psychological reasons, or an attempt to feign injury for various purposes, such as for improper receipt of worker's compensation. Companion DVD contains video footage of Dr. Evans performing and explaining each assessment test in the book. Full-color photographs demonstrate how to perform 237 orthopedic tests! At the Viewbox feature contains high-quality radiographs that depict various pathologies, as well as musculature and other anatomy that can't be shown photographically.